Fans of the TV show are probably beginning to notice that the ruthless Team Rocket of the game doesn't have a whole heck of a lot in common with the bumbling idiots depicted on TV. Their mission of world dominance has led them to Saffron City, headquarters of the Silph Company. Team Rocket has basically occupied the entire city, sending respectable citizens running while they force the staff of Silph Co. to make advanced weaponry for their nefarious purposes. They even blocked some of the houses such as the Saffron Gym. Saffron's a pretty dull place for a city of its size with not much taking place. 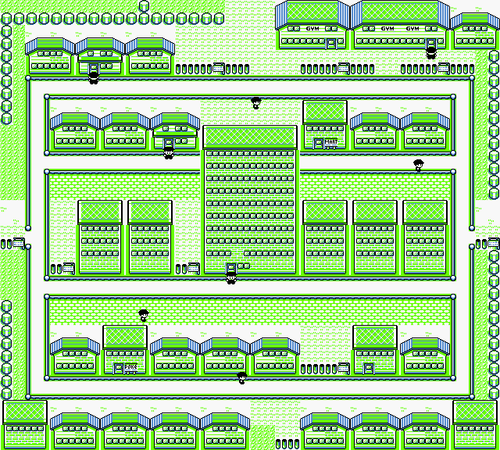 Outside of the Pokémon Center and the Poké Mart, there are only two buildings you can enter at this time. One is the Fighting Dojo (the left of the two Gyms at the top of town), and the other is Mr. Psychic's house (bottom right corner of town). Enter Mr. Psychic's house and he will give you one of the most powerful attacks in the game: TM29, Psychic. Psychic has a base power of 90 (the strongest Psychic-type attack), has 100% accuracy, and has a 30% chance of temporarily lowering its target's Special statistic. Due to the fact that Psychic attacks are only resisted by Psychic Pokémon themselves and no other type resists them, it is a great move to teach a Pokémon, especially if it can get a same-type attack bonus from it. Once you've driven the Rockets away by reclaiming the Silph Company building, you can enter the house in the upper-left corner of town. The little girl who lives here loves to mimic other people. She repeats everything you say, and you won't be able to have a normal conversation with her at all unless you bring her a Poké Doll. If you don't have one, head back to the Celadon Department Store to buy one. Give it to Copycat to receive TM31, Mimic, in return. 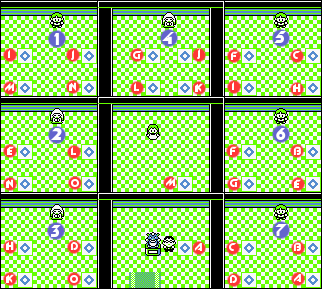 This move allows the user to pick one of the opponent's moves to copy in battle, while it still retains its PP. Not always useful, but at least virtually any Pokémon that can learn TM can learn it, especially if they need to borrow a good move to use. Maybe now she'll feel less shy and be able to relate to people properly! There's also a hidden Nugget near her computer. Although Hitmonlee is completely unable to deal with threats like a low-level Haunter, he's still a good Pokémon. Hitmonchan is versatile, but that's about it. You won't get a badge for taking down this optional Gym, but you will get something just as good: one of two Pokémon that can be found nowhere else in the game. Besides, beating this Gym is a cinch. The Pokémon used by the Blackbelts may be powerful (with them being around level 30), but all rely on the same Fighting and Normal-style attacks to deal damage. That means a single Ghost-type enemy can take down everything without being hit (Hitmonchan does have one seldom-used Fire-type technique, but that's all you have to fear). When you've bested the Karate Master, he'll offer you your pick of his two Pokémon. You can't get into Sabrina's Gym until you've saved the Silph Co. President within the Silph Company building. Only then will the Rocket blocking the door go away, and you can enter Sabrina's maze of teleport squares. The fastest way to reach Sabrina is to take teleporter A, then walk to the top left square at C, then to the bottom left square at I, then walk straight down to the square at M. If you want to get experience, you can fight the trainer here as well. Sabrina is in the center of the gym. Sabrina's Abra shouldn't cause much of a problem in Yellow, since it only knows Teleport and Flash and can't deal you any damage, making it very easy for you to set up on it with X items and moves that increases your Pokémon attacking stats. Kadabra is also not especially strong, due to its awful defense stat. It is Alakazam and his consistent use of the move Recover that will be a serious pain. Bug Pokémon are strong here, so a Parasect or Butterfree should be okay against Alakazam despite Bug-type moves being generally ineffective in this generation. The best way to deal with Sabrina is to take advantage of her Psychics' weak defense with physical attacks, such as strong Ground, Flying and Normal-type attacks. Dugtrio and its Dig and Earthquake work well due to same-type attack bonuses and a high speed capable of outpacing Alakazam, as well as Charizard's Slash, which has a high critical-hit ratio. Be careful of Sabrina's strong Psychic-type attacks, as with a high special stat of her Pokémon, they are able to sweep much of your team if they have a poor special stat or are weak against, especially her Alakazam, who has a very high speed which means it has a high critical hit rate to even likely override your special stat boosts. Defeating Sabrina will net you the Marsh Badge as well as TM46, which contains the randomly-damaging Psywave Psychic-type attack. The Marsh Badge gives you the ability to command traded Pokémon as high as level 70, although you're not likely to have need of such power for quite some time. Hitmonlee has an impressive repertoire of Fighting-type kicks. The Jump Kicks do solid damage (although misses occasionally backfire to damage him), and the Rolling Kick, while not as strong, can stop enemy attacks before they begin. Speedy and powerful, he's among the best of the Fighting Pokémon. In addition to the multiple-hit Comet Punch, Hitmonchan learns Fire, Ice and Thunder Punch skills, which do damage of the appropriate type and, 10% of the time, Burn, Freeze or Paralyze your foes. While this versatility and coverage is nice, these skills rely on Hitmonchan's dismally low Special, seriously hampering their effectiveness. This page was last edited on 2 February 2017, at 01:40. This page has been accessed 1,341,560 times.